Thirty years after the events of the first film, a new blade runner, LAPD Officer K (Ryan Gosling), unearths a long-buried secret that has the potential to plunge what's left of society into chaos. K's discovery leads him on a quest to find Rick Deckard (Harrison Ford), a former LAPD blade runner who has been missing for 30 years. The director in charge is Dennis Villeneuve, an excellent director with titles like Prisoners and Arrival (Check out our best of the decade sci-fi's) to his name. Blade Runner 2049 is directed by Denis Villeneuve and was released on Oct 6th, 2017. 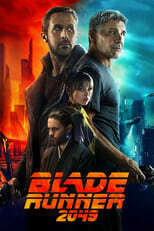 Director Denis Villeneuve's Science Fiction movie Blade Runner 2049 is produced by Torridon Films & 16:14 Entertainment & was released 2017-10-04.